On a picture perfect September 13, 2015, fourteen GRC members met our tour guide, Nikki, near the Como Conservatory outdoor ponds in St. Paul and began our visit with a walk around the beautiful Water Gardens. 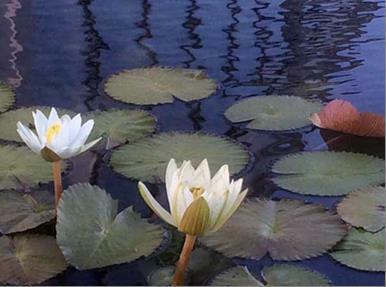 Water lilies abounded, many in bloom, some Minnesota hardy, and all lovely. The impressive Blooming Victorias floated languidly in the gentle breeze. Como is the only public garden in MN where visitors can see these wonders of the lily world. 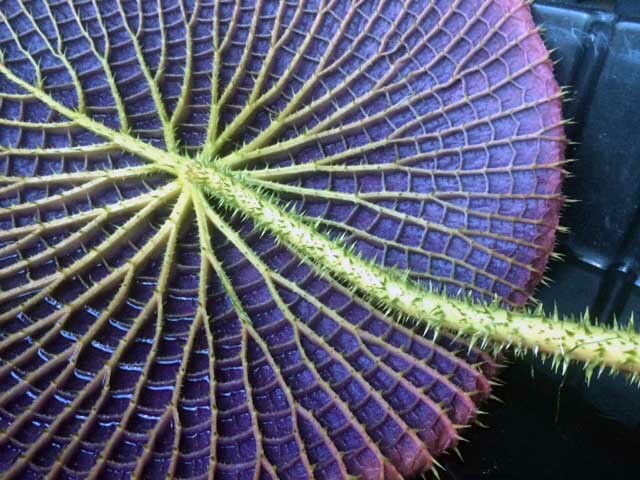 Conservatory gardeners coax these large exotics to life from pea-sized seeds to extraordinary water lily plants with signature platter leaves (some can reach six feet in diameter!) and unique life cycles. A real treat was our chance to go behind the scenes where the Conservatory’s gardeners work their magic. We saw the immense bags of soil mixture, workbench and potting areas, and large nursery rooms where precision mechanisms control light, temperature and humidity levels. A lot of work and horticultural expertise go into making the Conservatory’s many displays as beautiful as they are. As a special extra just for us, a gardener had set aside a leaf from one of the Victorias so we could see its spectacular underside. The sharp thorns, gorgeous colors and patterning were breathtaking. We wrapped up with a light supper and socializing at Como Dockside.